Bianca Sforni, Annatina Miescher, and Jonathan McVey, others around them, are first of all connected by friendship. And one idea lives in their minds: there is no such thing as outsider art. There are artists. Some of them were treasure islands found over decades of psychiatric practice by Dr. Annatina Miescher: they were self taught, sometimes in a strong conflict with life. 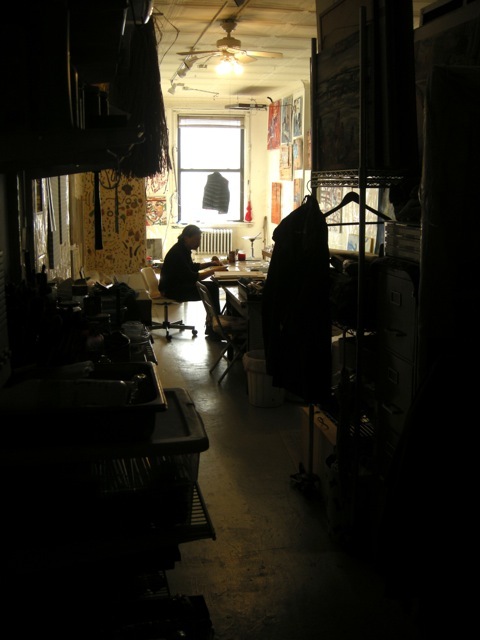 In 2011, after twenty years as a director of the Outpatient Chemical Dependency Program of the Bellevue Hospital in New York, Dr. Miescher invited them to be part of the 137ac (artist collective) and share a studio. Some of their works were hung on the walls of Bianca Sforni’s Noho studio on March 5th for an exhibition blessed by the snow. Bianca, or you could call her White, is a belated gift I received from Claudia, a friend for all her life, after she passed away. She was Bianca’s gallerist in Milan. I met Bianca in New York and we ate and ate remembering Claudia who used to love a great deal of good food. What’s stronger than friendship? Here’s the story, written by Annatina doctor, with images of the 137ac studio first and of her Bellevue Hospital office between words. 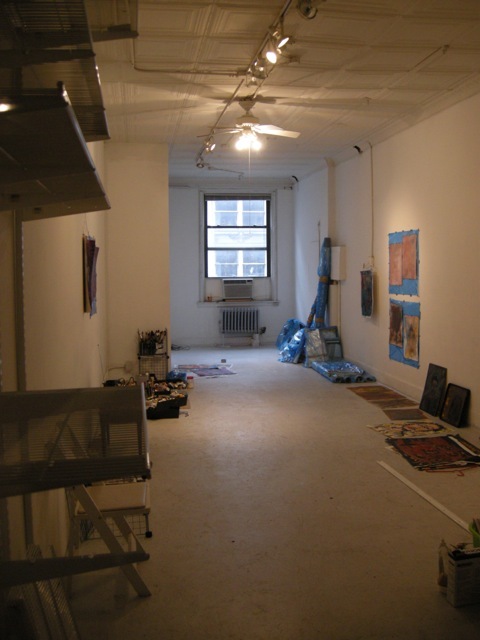 The 429.8 square feet studio is on the third floor of 137 West 14th Street in New York City. Four artist work there sharing all supplies. Kenny Guttierrez, the landlord, offered them a space in the building where he is creating a community he named Rat Park. He thought they would bring good karma. My parents pay the rent. 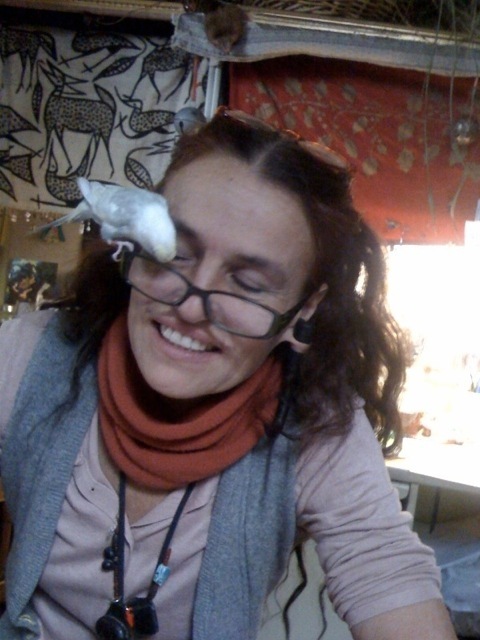 I clean and help stretch canvas. Jonathan McVey made me stick to my dream and became my associate. We created a non-profit building support for the collective. We have no written contract with the painters, they have it clear: the studio air is tolerance, care and respect while they inspire and challenge each other to explore and develop their talent to the fullest. They have their own keys. The four artists currently working at the studio are Paula Isaac, Janet Laing, Richard Lau and Uman while the collective counts several more. Painting need or desire and life circumstances do not always go hand in hand and the studio is small. Each artist has an extraordinary life course and could write a tremendous book, but they do not write, they paint. I hope you get to know them. Now the dream. Mid 2010 I ended my over two decades career in Bellevue Hospital in order to continue practicing psychiatry based on my experience and ethical values outside of an institution in which the bureaucratic constraints had suddenly risen above the patient care. My time at Bellevue had been wonderful, I was the director of the Outpatient Chemical Dependency Program and together with the dedicated staff and patients was able to build a wholesome community for people to practice sober life in a fun loving oasis that included art, food, patient government and economy, pets and gardening integrated with first class medical and psychiatric treatments. My office was an art collection of patient works mixed with found objects and found animals. A timber wolf, a one eyed black cat called Six Toes, a pigeon, a pair of gay doves and three cockatiels roamed free in my office. Art has always been a way of life for me and I apply it to everything. “Practicing psychiatry is like making sculptures with found objects, you take inventory of what the person carries and help them balance it to walk on in life.” One day an Art Brut authority visited my office and was impressed by the art. His words still resonate in my heart: “you have to make them paint”, while his name faded. So I had a dream debt: to see what the talented people I had met there could do if given the opportunity. This opportunity arrived in December 2011. I was introduced to Bjarne Melgaard who was looking for a source of painters to collaborate with. He offered to share his personal studio in Bushwick with painters without formal art education or contact with the contemporary art world. I brought eleven artists and became myself part of the group. Bjarne was an exceptional host, he made it a point to not interfere with our work and gave us unlimited access to art supplies. We understood he was looking for authenticity. Then he offered us his own painted canvas to collaborate on and asked us to do papier mâché pieces to illustrate a book we did not read. He included our works in his show at Ramiken Crucible, Ideal Pole part two: all words destroy and brought the collaborative works and all the papier mâché works to London in September 2012, to be in his ICA show, called “a House to Die in”, our group was called the Bellevue Survivors. Our time in Melgaard’s studio came to an end. We continued the group in a smaller version and adopted the name 137ac. the Bellevue Survivors name inspired people in the press to be at liberty to refer to us neither as people nor artists but “the schizophrenics”. 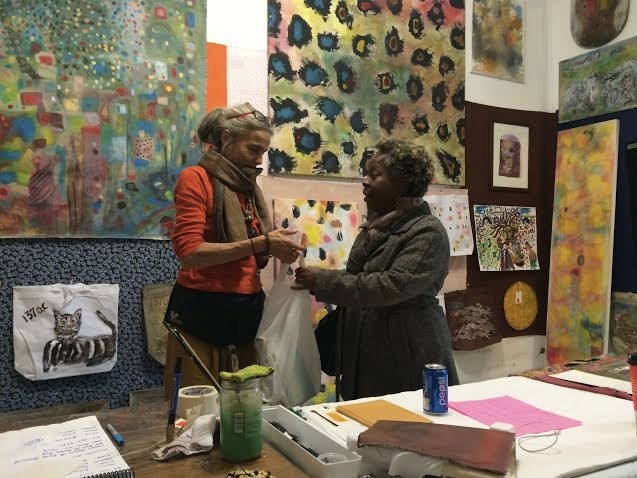 Melgaard continued to donate supplies, and curated our first 137ac show :”Dans ma Chambre” in a pop up space in the Chelsea art Gallery district in May 2013. 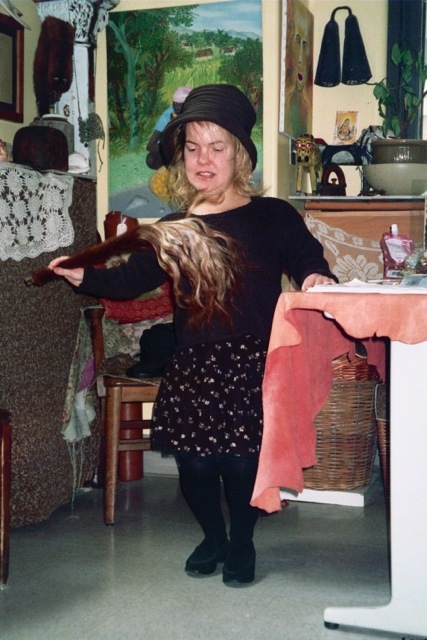 While we learned how to work as a collective we had another show “Artists in Resonance” at Adjacent to Life (http://adjacenttolife.tumblr.com) curated by Mark Roth in October 2013 and offered a couple of studio art fairs. 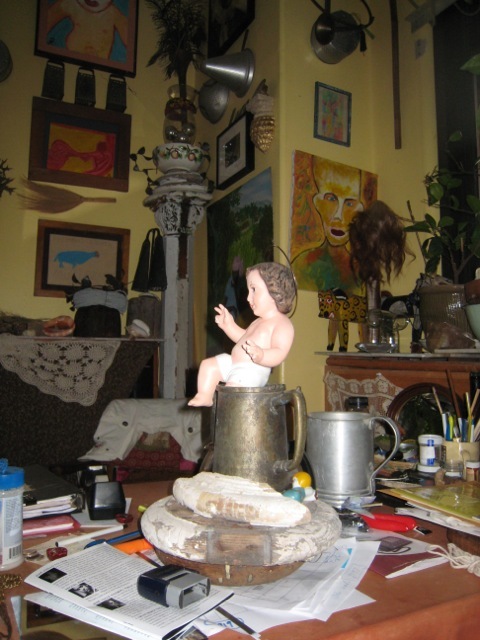 Then Bianca Sforni offered to host and curate a show “Art Brut” in her beautiful Bleecker Street Studio in March 2015. 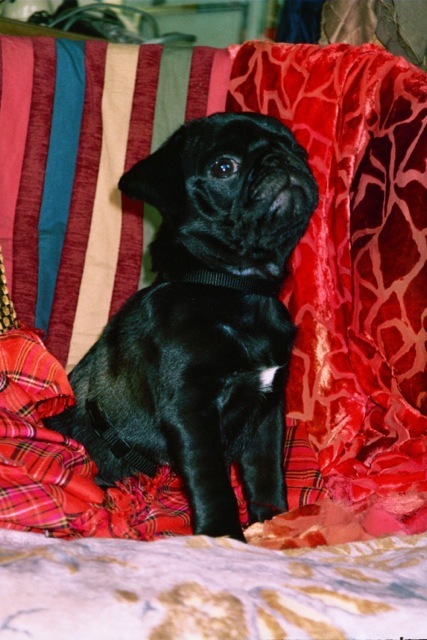 She had followed the collective since its beginnings in Melgaard’s studio. Her professionalism, dedication and care challenged us to realize we have a responsibility to take our place in the contemporary art scene. Posted on March 31, 2015 March 31, 2015 by turtle2028	This entry was posted in Art Brut and tagged Annatina Miescher, Bellevue Hospital New York, Bianca Sforni, Bjarne Melgaard, Jean Dubuffet, Outpatient Chemical Dependency Program, Raw Art. Bookmark the permalink.